Before we describe the steps needed to build a simple workflow in Flexie CRM, let’s first get an overview on what a workflow is all about, what is marketing automation and why does it matter, and what’s automation in itself. In the CRM context, a workflow is a series of steps that need to be completed in order to complete a sale or any other business-related process. It allows companies to automate repetitive but important tasks. Marketing automation, on the other hand, is an innovative technology, designed to help businesses automate marketing-related processes. For example, why send emails manually when you can do it automatically? Automating marketing-related tasks will not only help you save time and resources, but it will increase the effectiveness of your marketing campaigns. Navigate to the upper-right corner of the screen and click New. In order to start building the workflow, you first need to select the workflow entity type. 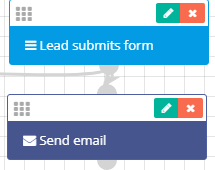 Let’s say you want to add points to leads any time they submit a form. Also, you want them to get started trying your product by sending a follow-up email. You don’t want to send the follow-up email immediately, though. You want to wait a couple of hours, say 8. 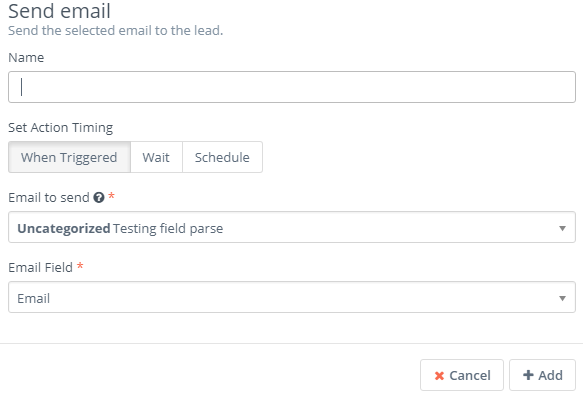 Since you want to add points to leads when they submit a form, and also send them a follow-up email, you should select Lead as the workflow type. Give a name and a description to the workflow, select a category(optional) and then click the Launch Workflow builder button. To start building the workflow, you first need to choose the workflow source. Let’s choose Listener as our workflow source. The Listener, in a way, ‘listens’ for events within the CRM, it monitors every activity. 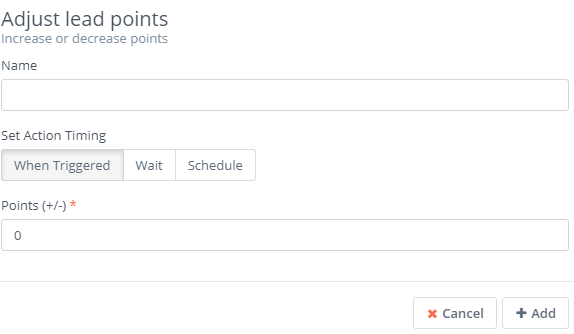 Now, we want to add points to leads any time they submit a form. Head to Watch for Events and choose Form Submission. Give it a name and then select Lead Capture Form. Next, click Add. 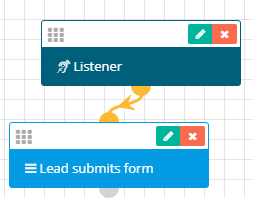 Make sure to connect the Form submission event with the Listener. Now, we want the system to execute actions based on the event, form submission in our case. 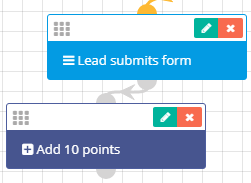 Specifically, we want to add 10 points to leads any time they submit a form. 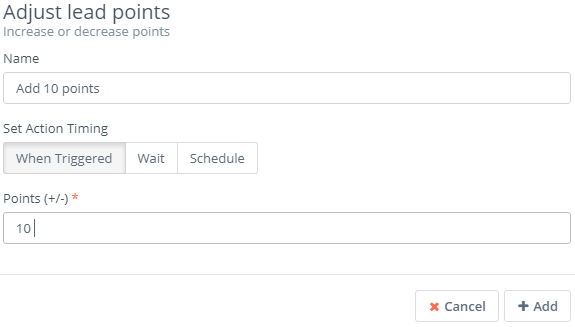 Go to Actions and click Adjust lead points. Give it a name, select When Triggered and when you go to points, set 10. You should select When Triggered because you want the action to be executed upon the lead submitting a form. Next, click Add. 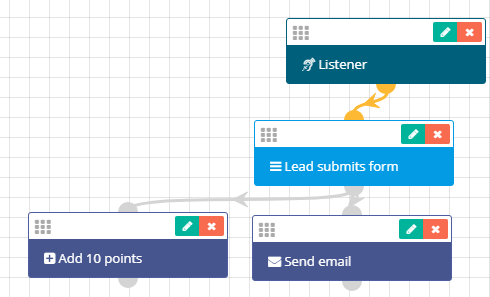 Connect the Adjust lead points action with the Form submission event. You also want to send an automatic follow-up email to leads who submit a form, but you want to wait 8 hours. Once again, go to Actions and click Send email. Give it a name and on Set Action Timing, select Wait. You want to wait 8 hours, so you first enter the number 8 on the left and then choose hour(s) on the right. Next, choose the email you want to be sent, the email field and then click Add. Make sure to connect Send email with the Form submission event. The workflow we’ve just created would look like this. Next, go to the upper-right corner of the screen and click the Close builder button. To complete the process, click Save & Close or Apply. You’ve just built a simple workflow. The concrete scenario above is just one of the many you can create in Flexie CRM.